The Carpenter's Ministry Toolbox: YOUTH ACTIVITY: Many People = ONE Group! 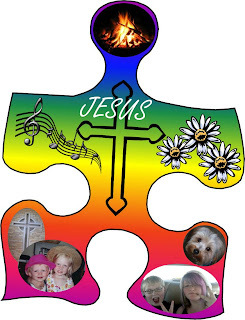 Next time you need to welcome the next class into the youth group or just want to try a cool unifying activity, try creating a huge puzzle that shows the faith and personality of the group. Give each kid a large puzzle piece (leaving the edges free to reassemble) and have them decorate it with things that describe their faith and who they are or want to be as a child of God. music, nature, family, and the cross. I looked far and wide for a place to purchase giant puzzle pieces but couldn't really find anything suitable so I'd take a template and copy it onto a large piece of cardboard or foam board. If you tape it to the wall to draw the template, don't forget to use painter's tape. Use a very sharp knife instead of scissors to cut it apart because scissors will crush the edges, making it look odd when reassembled. When it is reassembled, attach all the pieces together so it can be hung on the wall. It'll be a beautiful portrait of every unique soul in the group! !